Imagine not taking your kitchen garbage out for weeks, months, even years? What is it going to look like? What would it smell like? The #1 cause of most health issues/problems is: Autointoxication (Auto means “self”, intoxication means “poisoning”). 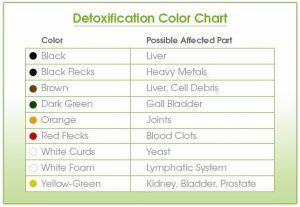 Keep reading to learn more about our body detoxification process. We are constantly exposed to levels of pollution from: air pollution, fertilizers, water chlorination, growth hormones in foods, antibiotics, fast food, and lack of rest. These factors build up toxins in our blood, lymphatics, kidneys, liver, and muscles. The Ionic Foot Spa Detox and Cleanse Cell is an ionized foot bath designed to restore the body’s energy and balance the pH, while facilitating the body’s natural detoxification process. This process pulls unwanted toxins out of the body. A bio energetic ionic exchange system or field is created and it surges positive and negative ions through the body. The impurities in one’s body will be attracted to either the positive or negative ions. They are pulled through the lymphatic system and the blood stream and get extracted from the body by osmotic pressure at the skin of your feet. The color and consistency of the water in which your feet have been soaking shows a result of pollutants being removed from your body’s systems. Bioenergetics is important because the amount of energy a person has contributes to the capacity of the body to eliminate, digest, sleep, move, and feel alive and well.